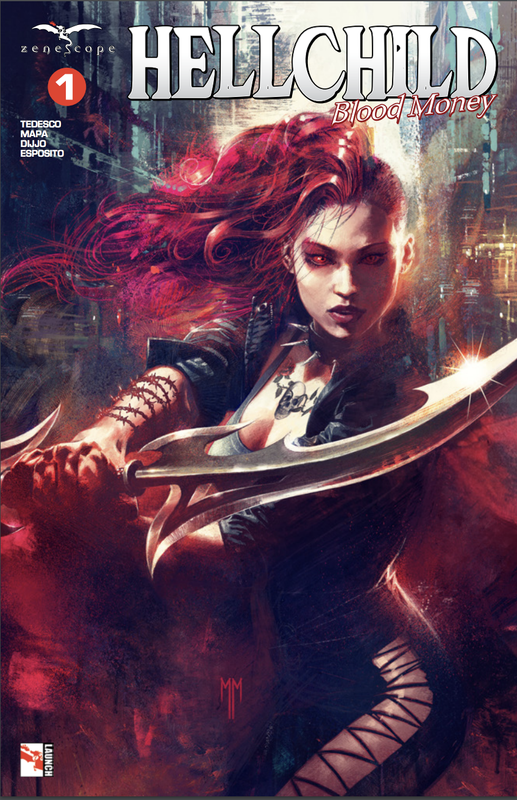 The Fellowship was fortunate enough to obtain a copy of HELLCHILD: BLOOD MONEY #1 from Zenescope Entertainment. The story is written by Ralph Tedesco (from a story Joe Brusha, Ralph Tedesco, & Dave Franchini); with art by Butch Mapa, colors by Dijjo, and lettering by Taylor Esposito. Angelica Blackstone, the half vampire daughter of Hades, is hired by a hired by a rich, influential man who wants her to protect his no-good son. It seems the son has got himself in trouble with a VERY dangerous man that will have deadly consequences. We know this is not going to end well for those who oppose our hero, but will be fun to see them find out. I like Angela’s style and “don’t mess with me” attitude. With a dark character and storyline, one would expect a muted color scheme. Dijjo knocks it out of the park here; love his choices. I am not familiar with Butch Mapa, but enjoyed what I saw here and want to see more of his work. On top of this is a fast-moving, fun script that made an enjoyable book. Check it out. HELLCHILD: BLOOD MONEY #1 is in stores now or available at www.Zenescope.com.